AN INJURY TO first-choice goalkeeper Tim Krul means that Republic of Ireland international Rob Elliot will continue as Newcastle’s net-minder for the foreseeable future. Magpies’ boss Alan Pardew revealed the Dutchman’s ankle problem will see him miss the next ‘four or five games’ and ensures Elliot, who deputised in yesterday’s 1-0 defeat to West Ham, will continue between the sticks. Elliot couldn’t prevent Newcastle from falling to their first defeat since late-September though with Aaron Cresswell grabbing what proved the game-winning goal after 56 minutes. It was the 28 year-old’s first league appearance of the season but can now look forward to being involved in a litany of high-profile fixtures. In the coming weeks, Newcastle take on league-leaders Chelsea, visit Arsenal at the Emirates, clash with Tottenham in the League Cup, host Sunderland in the Tyne-Wear derby and travel to Old Trafford on Boxing Day. How does Louis van Gaal prepare for Manchester United matches? Email “Ireland's Rob Elliot set for prolonged stint between the sticks at Newcastle”. 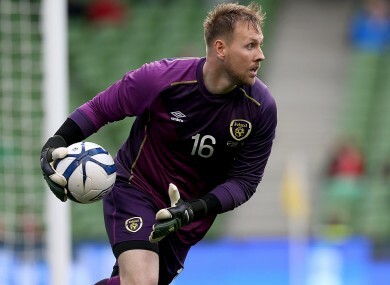 Feedback on “Ireland's Rob Elliot set for prolonged stint between the sticks at Newcastle”.